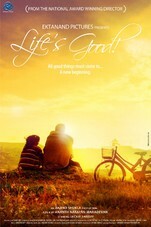 Life's Good is a story revolving around a forty year old Rameshwar, who after the death of his mother is plunged into loneliness and depression. On the verge of killing himself, his life takes a surprise turn when a six year old girl Mishti, breaks his window glass and enters his life. The long standing friendship between them as Mishti becomes an integral part of his life. The story of Life's Good, penned by the acclaimed Sujit Sen who also is known for writing films like Saaransh, Arth, Hum Hain Rahi Pyar Ke and Angaar. Hema Malini: My son-in-law is very good looking!